As a highly-flexible and extremely compact laser combiner, C-FLEX lets you combine up to 6 wavelengths out of more than 30 wavelengths available. The lasers can be controlled either separately1) or via common USB port2). 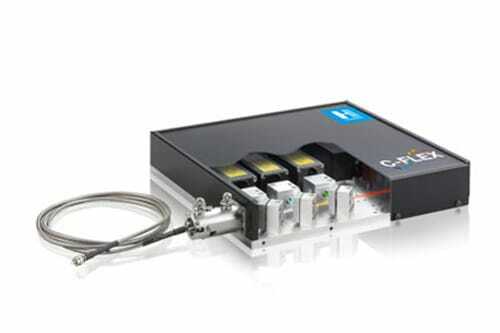 C-FLEX is field-upgradeable and ready to mount DPSS or diode lasers of the Cobolt 06-01 & 04-01 Series as well as most common lasers for laser combiners on market3). The flexible design enables integration of optional AOM modulators that allow fast modulation of DPSS lasers. Free space beam output or fiber coupling options are available. C-FLEX comprises countless options to make it your first choice in laser combiners. * Depends strongly on laser configuration and can be significantly lower.